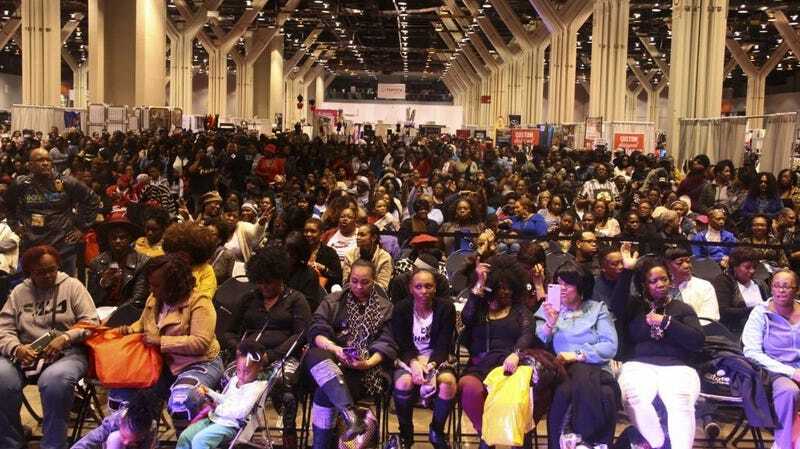 A packed house at the 2018 Black Women’s Expo in Chicago. “When people talk about black girl magic, we got it going on here in the city of Chicago,” says Merry Green, creator and founder of the city’s Black Women’s Expo, which celebrates its 25th anniversary April 12 through April 14 at the McCormick Place convention center, with BET Her as its title sponsor and the hashtag #SheMatters. Green is speaking of the recent wave of black female political wins in the city, including the election of the city’s first African American (and openly gay) woman mayor, Lori Lightfoot, who will be on hand for this year’s ribbon cutting, as well as the first black female treasurer, Melissa Conyears-Ervin. And, of course, there’s also freshman congresswoman Lauren Underwood, who yesterday announced the launch of the Black Maternal Health Caucus, a hopeful gamechanger in the fight to decrease the dangers of childbirth for black mothers and children. It was issues like these that prompted Green, then promotion and marketing director for Chicago’s V103, to create an event that reflected the 60 percent female demographic employed at the station (and likely, their listening audience). While hosting a bevy of black entertainers and businesses, the concerns that affected our community were also foremost in Green’s mind. Black Women’s Expo creator and producer Merry Green. Angela Yee during a 2018 panel discussion. Tami Roman during a 2018 panel discussion. Actress-entrepreneur Kimberly Elise (r) and her daughter in front of her booth of natural beauty products. The Mane Event beauty booth. With 25 years of event success now under her belt in an event that includes performances, panels, culinary tastings, exhibits, small businesses and more, you could say Green was well ahead of the curve in recognizing the power and marketability of #blackgirlmagic. What we recognize as a timeless phenomenon was seemingly only recognized by mainstream media with the arrival of Nielsen’s 2017 report, African-American Women: Our Science, Her Magic. But as Green told us, tapping into what is now a time-honored event was, in part, a happy accident. Twenty-five years later, Green credits the community with keeping the Expo relevant for new attendees. This year, in addition to performances by Eric Benet, Leela James and more, visitors can look forward to a new forum on black female political power titled “Her Story” taking place on Saturday; on-site consultations with not one, but two sets of identical twin doctors; a Natural Hair Pavilion; and the AARP-sponsored “Fab & 50+,” featuring Living Single’s Kim Coles. And proving that the Black Women’s Expo is for all ages, they’re introducing a new Senior Pavilion for attendees over 60; a “Silent Lounge” for millennials, where guests can create their own silent party while listening to various DJs via headset; and the “Kid’s Korner,” to make sure little ones stay active and engaged. There are a lot of moving parts, to say the least—especially with satellite events in Atlanta and Dallas. But when asked what she’s most proud of in creating and producing The Black Women’s Expo, Green tells us it’s keeping it going for 25 years—with hopefully many more to go. “I didn’t realize what a major milestone this was—because when you’re working, you’re working,” she said, revealing that the impact of the effort only hit her a couple of months ago when she received a letter reflecting on the history of the event that brought her to tears. But for now, it’s the future Green has her eye on, including teaching and hopefully passing the torch to her “mostly millennial” staff, whom she hopes will pick up the mantle of the Black Women’s Expo. And while riding the inevitable ups and downs of running a now-legacy event, Green tells us it’s the community and their feedback that remain at the forefront of its evolution. The Glow Up tip: The Black Women’s Expo takes place at Chicago’s McCormick Place from April 12-14. You can get tickets and more information on their website.